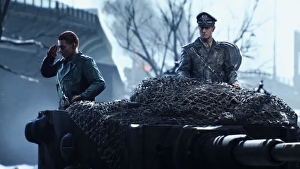 The Battlefield 5 campaign lets you play as the Nazis, but “it’s not a hero story”, the developers have insisted. The Last Tiger, the last of the game’s War Stories due out in December 2018, is set during the twilight of World War 2 as the German army “descends into chaos”. It follows a lone Tiger tank crew that “begins to question the ideology that got them to this point”. In an interview with Eurogamer, franchise design director Daniel Berlin said The Last Tiger is not a hero narrative, and expanded on why DICE decided to put it in the game.